It’s taken long enough, but Orson Scott Card’s classic sci-fi novel ENDER’S GAME – about a school where gifted children are trained to become ruthless commanders in a war against an alien menace – has finally made the leap to the silver screen. The film has had to struggle through a thicket of production problems, not to mention controversy over the author’s, shall we say, less than enlightened politics. One thing you often see when a film is going through issues like this at a late stage is a rejected score, simply because it’s one of the last things to be completed on a film and is therefore one of the only things that can still be changed. 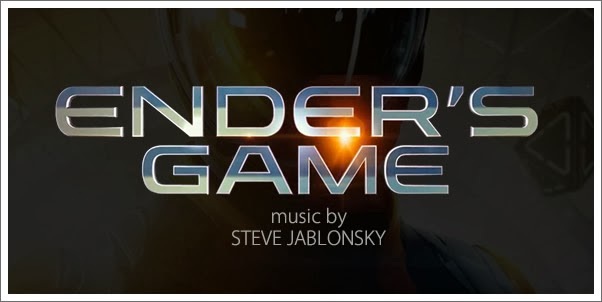 And that is apparently what happened with ENDER’S GAME, with JAMES HORNER leaving the project (ostensibly before he was able to record any material) and being replaced with one of the film score community’s favorite whipping boys, STEVE JABLONSKY. Reactions to this news were, to put it mildly, rather displeased. Not all of the criticism heaped on JABLONSKY has been entirely fair – he is undoubtedly a talented composer, as his outstanding score to STEAMBOY continues to prove – but he is so rarely allowed to use the full extent of his musical muscles. He is the epitome of hit-and-miss, and with each score he puts out, you simply have no idea whether it will be a hugely enjoyable, thematic guilty pleasure along the lines of TRANSFORMERS, or rather a vicious, noisy, intellectually bankrupt assault on the ears a la BATTLESHIP (we can take STEAMBOY out of the equation as it looks less and less likely that JABLONSKY will ever revisit that sort of writing, sadly). ENDER’S GAME exists somewhere in between those two ends of the spectrum, but unfortunately it resides far, far closer to the latter than the former.